Congratulations on being a 2019 SR. High All Tournament player. Please answer the questions below regarding the upcoming All Star Tournament on May 4th at Russellville High School. More details will be communicated through Remind as soon as we know them. Please remember to sign up for Remind to receive updates and information about the tournament. Text @19srstars to 81010 or (312)945-7432. A confirmation email will be sent to your coach. Friends of Quiz Bowl is establishing a moderator program. For more information please follow this link . No video, photography, or sound recording is allowed at Invitational, Regional, or State Tournaments without written permission forms signed by everyone one in the room. ALL minors must have a parent or guardian's permission signature as well. If you have any questions please contact the site host at the event you are attending. If you would like to post a tournament please contact agqba.calendar@gmail.com with the details. Forms and contact informaiton for events will be posted on the All Invitational Tournament Dates page. Questions from previous seasons now available. These are a great practice resources. There are four volumns of questions at each level. Please see the Coaches Resources page. Don't miss this valuable resource! The 2018 videos are posted! It was a great day of action packed games! 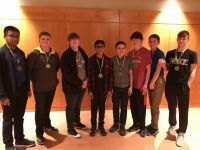 Watch a State Finals video to see Quiz Bowl students in action!